Day 13 of a 26-day field trip to Eleuthera. The daily grind has well and truly set in. The winner of our rock-paper-scissor games no longer chooses to go in the water, but to captain the boat and stay dry. Time for a break from lionfish work. 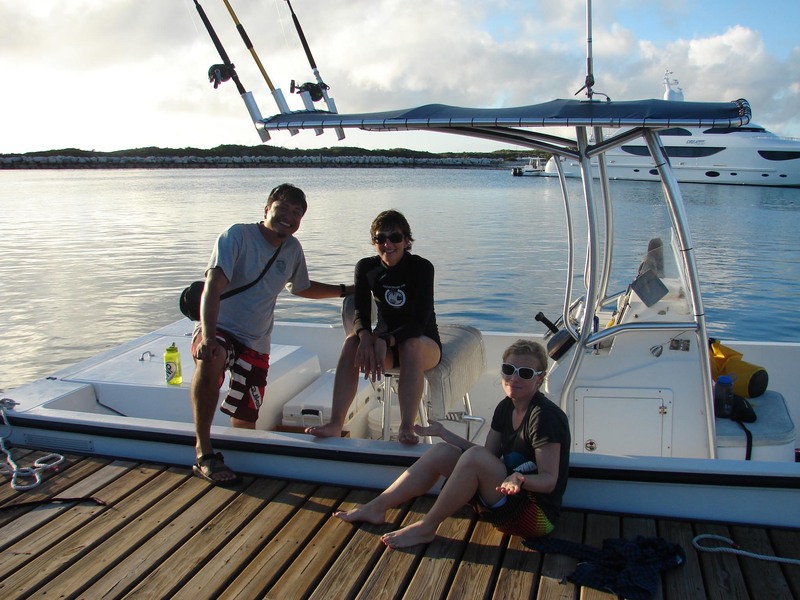 So Luis, Emily and I jumped on an 8 AM offer to go find a satellite tag that had been put on an oceanic whitetip shark eight months ago by Edd Brooks, head of the Shark Research and Conservation Program, at the Cape Eleuthera Institute. The tag had just popped off and was drifting through the Exuma Cays, some 40 km southwest of us. There were a couple short windows of time during which the tag would transmit data to an overhead satellite, and it would then be possible for us to pick up its signal with a receiver. But we needed to leave NOW! So we grabbed breakfast (Bahamian fish stew), sunscreen and cameras, jumped into the MacDaddy, a 26-ft diesel panga, with Edd and his assistant Tyler, and set off. The 90-min crossing was uneventful, bar a few coughs from ol’ MacDaddy. Flying fish and flying squid took to the air at our approach, gliding over the deep waters of the Exuma Sound. We reached Highbourne Cay, slowing down only briefly to gawk at the enormous yachts in the marina. Time was running short. The morning transmission window was closing fast, and we had 10 more km to go to get to the last recorded position of the floating tag. Would we get there in time? We made it, but not quite soon enough. Edd stood on the bow, holding towards the horizon what looked like an old-fashioned TV antenna. Every minute, a muffled buzz was heard, signaling that the tag was nearby. The louder the buzz, the closer the tag. But unfortunately, it’s just a short buzz, once every minute while the tag transmits a bit of data to the satellite above. This makes finding the right direction, let alone the exact location, really difficult. And then the window closed. The satellite was gone, and we had to wait until the next one came within reach, two hours later. So we anchored and waited, had lunch and waited, went for a swim and waited some more. 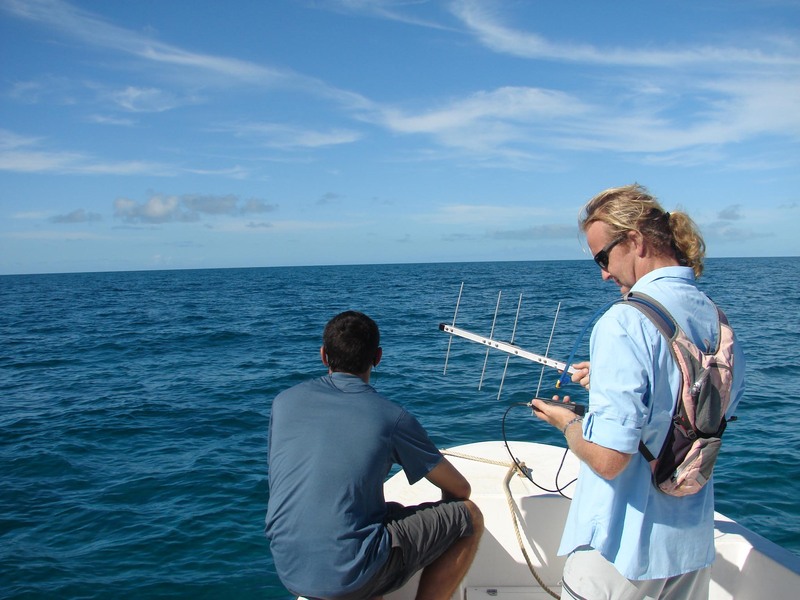 I had always thought that being a shark tracker must be one of the most exciting jobs in the world. I hadn’t anticipated that it would involve so much…waiting! When the tag came alive again, it had drifted and the buzz was faint. We moved the boat back and forth, all eyes on the water, hoping to glimpse a small, black (yes, black! Why not bright pink??) box with a protruding antenna – a slight anomaly in the pattern of the waves. After 2 hours of searching for this elusive needle in a haystack, it was time to admit defeat. The tag would transmit for another week or so, but just coarse data on time and pressure, not the wealth of fine-scale information that it kept in its memory and that could allow Edd to reconstruct exactly what the shark had done and where it had been over the past eight months. Maybe the tag will wash up on a beach elsewhere in the Bahamas.